For the best in portable mobile storage units, trust your storage needs to Haulaway. For high security, great service and customer satisfaction, you can’t go wrong. Our units work for a variety of needs, from temporary storage during a remodel to on-site storage for construction equipment. Save money on renting a truck or an expensive off-site storage unit by using mobile storage units for a convenient, portable, and secure place for your property. Whether you’re trying to keep a work site clean or need a place to store holiday decorations during the off-season, mobile storage units are a safe bet, literally and figuratively. 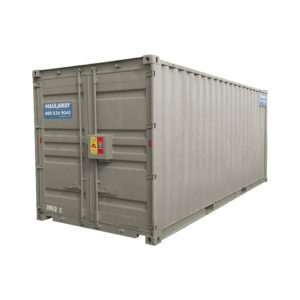 At Haulaway, we offer portable mobile storage units in a variety of materials and sizes to meet your needs. They’re made with 14-gauge steel with hardwood and steel floors, as well as easy ground floor access so that your belongings are both protected and accessible when needed. Water-resistant construction keeps the elements out so you never have to worry about water damage. These units are convenient for homeowners and business owners alike. We offer containers from a smaller 10-foot unit perfect for individual property owners, to custom made 40-foot units that can be used for construction storage for equipment, supplies, tools, and product. Haulaway services the Western United States, and can offer mobile storage units to most major cities in Arizona, California, Oregon, Washington, Nevada, Utah, and Colorado. Portable mobile storage units are useful for keeping paper goods, vehicles, event materials, lawn equipment, construction supplies, and anything else you can think of. Haulaway offers the very best selection, the fastest delivery, and plenty of affordable options. If you have specific storage needs, give us a call anytime so we can help you figure out the best solution for you. We’re always available to answer questions!